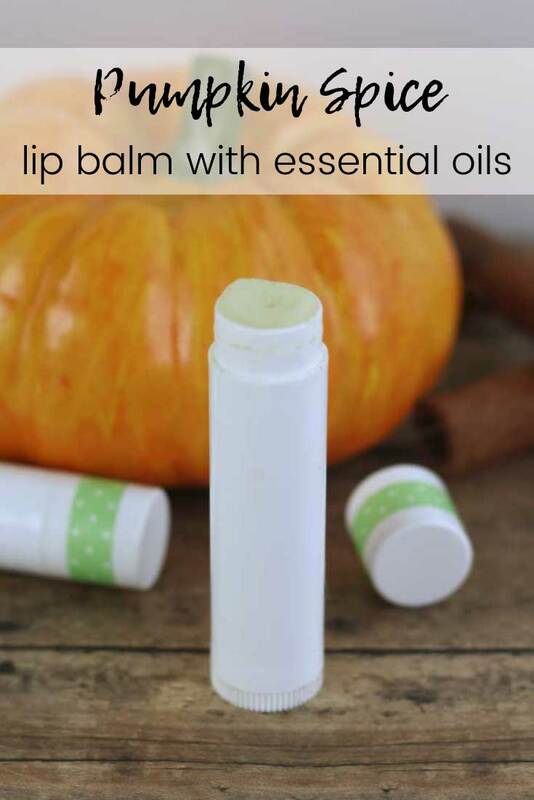 This pumpkin spice lip balm recipe uses essential oils for a natural scent. The beeswax and oils will help keep your lips soft, even in the dry air. I may have a slight addiction to lip balms. I have them in my desk at the office, in my purse, in my car, and one beside my bed. I like to change the flavors with the seasons, and right now I'm all about pumpkin spice in case you didn't notice. For those of you who are not pumpkin spice obsessed or maybe just sick of it this year, I am going back to regular programming on Friday, so be sure to check back then. Next week, I'll have some fall scents that aren't pumpkin, but I can't promise this is the absolute end of pumpkin spice this year. 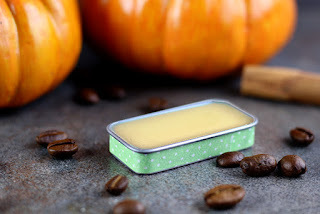 Last year, I made a pumpkin spice latte lip balm that's been really popular. This year, I realized that I'd never blogged a plain pumpkin spice lip balm. Since I have the new essential oil blend, I figured i was the perfect time to make it to share with all of you. To make the perfect lip balm, it needs to have ingredients that will soften your lips right away, ingredients that work for hours to soften your lips, and something to protect your lips. In this recipe, jojoba works fairly quickly to soften and moisturize your lips. The beeswax protects, and the vitamin E oil keeps working for hours to keep your lips moisturized. If your lips are really dry or chapped, I highly recommend using a lip scrub first. It will remove dead skin so your lips will look better instantly. I like this vanilla mint lip scrub and use it about once a week. Jojoba oil is actually a wax and not an oil, but it's commonly referred to as an oil. It's thick, so it sits on top of the lips and forms a barrier to trap in moisture. It's my favorite carrier oil for the lips because it works so well at keeping them moisturized and preventing chapped lips. You can use another carrier oil if you'd like. Avocado oil would be a great choice for dry lips. If your lips aren't very dry or prone to getting chapped, then try sweet almond oil. To learn more about the different carrier oils and their benefits, check out my book Carrier Oils. Beeswax is used as a thickener for this recipe, otherwise it would be a roll on lip gloss. But beeswax is much more than just a thickener. Beeswax also helps create a barrier to lock in moisture, which can help treat or prevent chapped lips. Beeswax also has vitamin A, which can help protect your lips from future damage. Vitamin E oil is high in antioxidants to protect your lips. It helps soften skin (and lips! ), so it helps soften already dry lips. Not all vitamin E oils are created equally. I've used a few different brands, and the Crafty Bubbles version I linked to above is my favorite by far. It's very thick and seems to give me better results in my lip balms and lip glosses. I won't mention brand names, but I've used some that were very thin and just didn't offer many benefits for my skin or lips. Although the ingredients don't say it, I think they were diluted or used inferior ingredients. For this recipe, I used Crafty Bubbles Pumpkin Pie Spice essential oil blend. You can make a pumpkin spice blend on your own, but I knew I wanted to use in several recipes this year. I asked the owner of Crafty Bubbles to make a blend so it would be easier for me and for my readers. You can buy a three pack of 0.5 ounce bottles on Amazon or get it in a holiday four pack with Apple Pie Spice, Candy Cane, and Gingerbread. Combine jojoba oil, beeswax, shea butter, and vitamin E oil in a double boiler. Melt over medium heat until melted, stirring frequently. I set my Pyrex measuring cup in a pan of water to make a double boiler. I set the measuring cup on a canning jar lid to keep it off of the direct heat. Once the beeswax is melted, carefully remove from heat. Let cool until it's below 180 degrees. If you add the essential oils when it's too hot, they will burn off. I use a laser thermometer to test the temperature. Carefully pour into lip balm tubes or small lip balm pots. 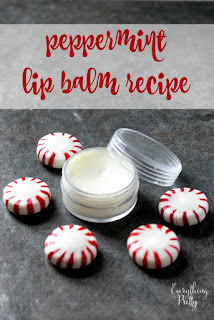 This recipe should make about 10-12 lip balms tubes. I use both lip balm tubes and the pots. I prefer the tubes just because they are more sanitary. If you don't like using plastic, there are paper lip balm tubes that are biodegradable and work really well. I somehow ended up with 100s of the plastic ones, so I'll keep using them until they are gone and then order some paper ones. Not ready to DIY? 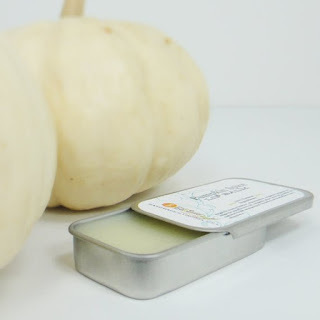 Try a handmade pumpkin spice lip balm from Etsy like this one from Pure Palette.